Lucy and Viv are birdsitting for Mr. Mooney's cockatiel, Greenback. After accidentally letting the bird escapes its cage it flys away and perches on a telephone line outside. To reach the the bird, Lucy climbs up on the roof in a grass skirt after her pants split and rubber swim flippers for insulation from the power lines. After failing to recapture it, the girls buy another bird and try to pass it off as Mooney's beloved Greenback. Special Notes: Mr. Mooney's pet bird is a female cockatiel named Greenback. 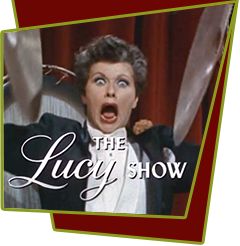 Lucy teaches it to say, "Give Lucy more money." Bloopers: While on the roof, Viv mentions that the last time she was up there was when the two put up the TV antenna (Lucy Puts Up a TV Antenna). Even though it's the same house, the antenna is in an entirely different location and the entire design of the roof is different.